Here at our bitty homestead, we’re in our fourth year of gardening in the raised beds that Michael built. 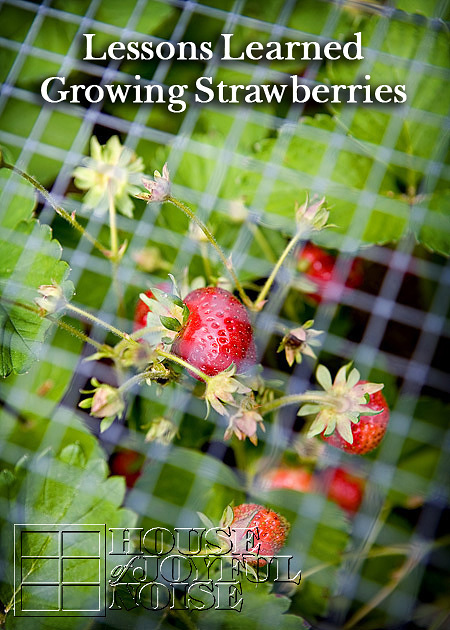 This includes growing strawberries, which has come with a few surprises and lessons learned, some quite by accident! I thought I would tell you a little bit about that today. Especially because lately, we’ve had more strawberries than we’ve known what to do with, and it was the last thing we expected. 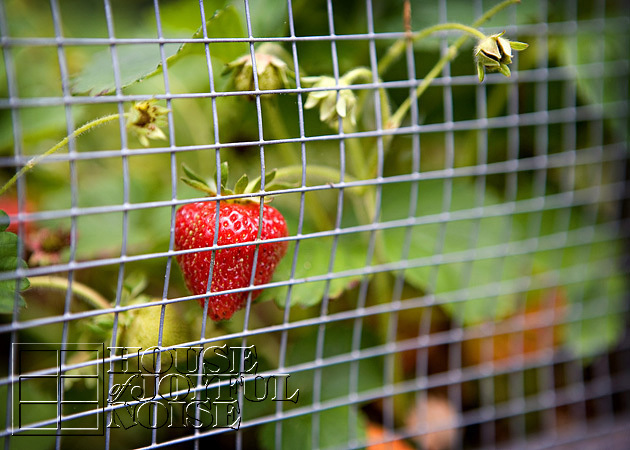 The first thing we learned, the very next morning after planting our very first strawberry starter plants 4 years ago, was that we needed to find a way to protect them from the birds and small animals, if we ever wanted to have any berries to pick. There were squirrels feasting on our new plantings in our bed, and that put Michael in high gear. By the end of the day, he had built this ‘cover’ for the strawberry bed, that has protected it 100% ever since. It is just made of chicken wire and strapping, but it has been the perfect solution. It lets all of the light and rain/water in, the hungry critters out, and lifts right off for picking time. Initially, we had planted both Ever Bearing, as well as June Bearing plants. But after 2 years and not being so happy with the June Bearing plants, we ripped them out at the beginning of last season, and let the Ever Bearing take over. They were just too small, and not as good as the Ever Bearing. We weren’t sure we’d get any more Ever Bearing berries out of it that late in the game, but at least the June Bearing were out of the way. In the first couple seasons of production, we got some consistent berries to pick. There were some every day. But rarely enough all at once, to really do anything with. So we just ate them snack-style all within the day we picked them. Year/Season 3 (last year) was better in the overall crop, with the Ever bearing having taken over the bed, and producing after all. We actually had enough at once to have dessert a few times. I also saved the berries picked a few(0ther) days in a row, vacuum sealed them in a freezer bad, labeled and dated the bag, and put them in the freezer. BTW, the vacuum sealer machine was a brand called ME. ; ) I sealed the bag tightly with a drinking straw stuck in the bag, put my hot lips up to it, and sucked all of the air out myself! Until it was pretty shrunk-wrapped looking, and I was blue. 1) In the beginning, we had researched a lot on strawberries, and read that strawberry plants tend to only produce for about 3 years, before you really need to start again, because they won’t produce much anymore. The first season is also expected to be somewhat of a slimmer crop, because the roots are really just trying to get established in the soil. In fact, it’s recommended that you pluck off the first flowers that produce (indications that a strawberry is about to form there), to give those roots more time to establish well. 2) Another thing we had read to do, was to cut or mow the plants down to an inch or 2 at the end of the season, and cover the whole bed with hay, or some other non-seed producing mulch, for the frost season. Then in the spring after any risk of frost had passed, you could remove the top layer or so if there was a lot of it, but that generally the plants would grow right up through it – and then prior to breaking ground, the plants down in the soil would be protected from cold temperatures. So that’s what we did, and we found all of that to be true.In the meantime, my friend Paula told me that some woman Ann…or Annie Something…. (I gathered from the way I was told, that I should know who this woman was…), highly recommends not covering your beds with any extra mulch of any kind. However, come the end of Season/Year 3, we figured those plants were DONE anyway. We had gotten 3 years out of them, and planned on plating new starters the following spring. So did not bother covering the bed with hay. We just let all of the abundance of plants, with stems, runner, leaves and all, just die there in the bed. By autumn, it was looking as neglected and ugly as could be, in that cage. And early spring was not looking much better. Until, new green plants broke through the broken down decay all around it. We still figured they would develop much, and that we’d need to plant new at the end of May or so. But they just kept growing, and then they were flowering and producing like (not yet mature) berries, all through May. By June, we were picking! Our very first picking, was a pretty healthy bunch! But there were SO many more than these, that we would have picked as well. We just wanted to give them one more day. From then on, there were many strawberries that needed to be picked, every day or 2! So we had to gather, that Ann(ie) Something was right. There is no need to go through the extra efforts, or expense, of covering the beds with any other form of mulch, to protect them plants from the cold. The plants all dying down at the end of their season, establish themselves as their own bedding cover. In fact, it seems allowing that, by intended means of giving up these old plants, somehow reaped a supposed extra year of production, and our overall best and largest season of strawberries ever! 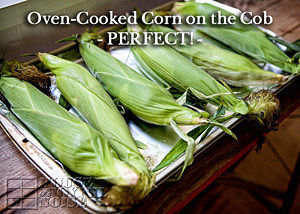 So as you have probably gathered by now, we’ve been learning along the way here, and it’s been delicious and rewarding! Who knows. Maybe we’ll get a 5th year out of these plants, next year? Yeah…..likely not. But we all feel like we know more now, to be more successful in growing strawberries, than ever. That’s really part of the fun of gardening: learning! The kids have labored and learned right along with us, and it’s been so wonderful. 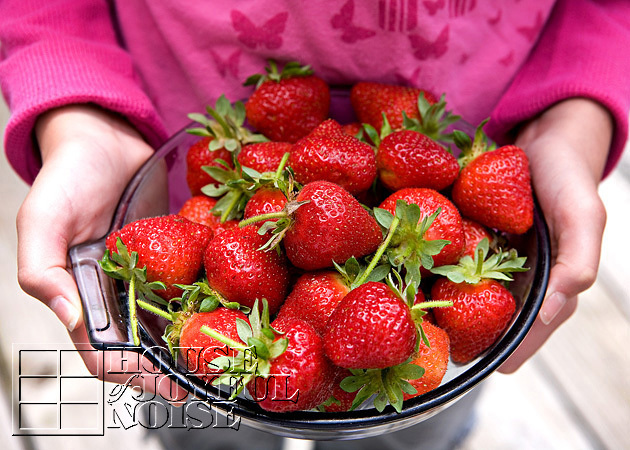 You might be wondering, what we did with having such a constant flow of incoming fresh strawberries on our hands. Well……we ate some as we washed them. Some were fresh berries on top of our cereal in the morning. There was Strawberry Shortcake to be had, a few times. And lastly, some more went into the freezer for the plan of making jam, and others were made into a new and creative snack dessert. The last two mentioned, are new strawberry-themed posts, coming up soon. So stay with us! 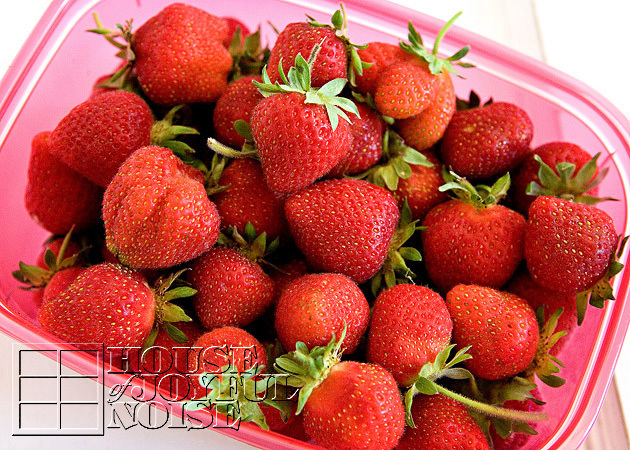 Do you grow strawberries? In beds or out of the ground? 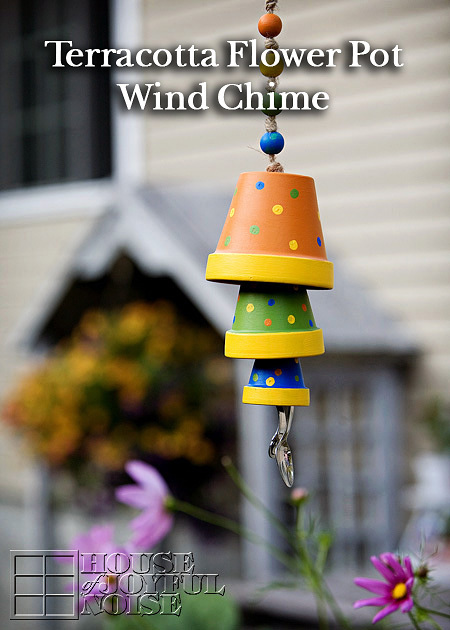 How do you keep the birds and critters from eating them? Tell us about your strawberry-growing experiences, or hopes. Come join us on FACEBOOK, or TWITTER! What do you do after the 4th or 5th yr when you need to start over? Tear everything out and plant new? Then do you have a year or two without strawberries? No one ever seems to talk about that. 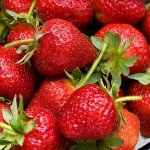 Hi Barb – We have found there are always strawberries, even in the first year, with new plants. It’s just a much smaller crop the first year. If you have 2 crops going that began on alternate years, you would never be out of plenty. Just an idea. Thank you for all this information. I’m a first time planter in the gutters planting , Last year i planted my strawberries in plastic, it went well, but I’m trying the gutter planting this year. The feedback given on this web, really helps a lot. Hi Yvette!! I’m guessing you missed our latest post on growing strawberries, and our outcome of trying to grow them in rain gutters! We recommend reading this post, as well as BOB’S comment, in the comments! More very valuable and educational info for you! Good Morning, Just read about strawberries: lessons learned. May I ask a couple of quick questions? 2) what is the spacing of the plants (how far apart did the first plants go in at?) in the box. 4) what zone are you growing in? 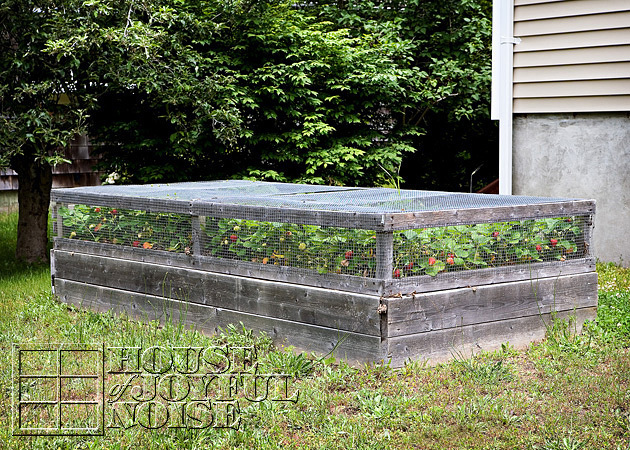 1) The dimension of our strawberries bed is approx 4’wx8’lx12’deep. The cover is the same, to rest and fit perfectly on top, and to allow plant growth height. 2) I believe the initial plants were supposed to be spaced about 18″ apart, but I am sure we squeezed the spacing a little there, and cheated-configuring the space we were confined to, and to make the plants even. But know that the plants to send out runners that replant, so it’s all the same soon enough! LOL. Although you are supposed to control the runners early on. 4) Hmm….well I SHOULD know our ZONE. Because well, I’m a gardener now, right? So your question forced me to Google and learn something knew. THANKS!! It seems I’m in Zone 6-7. Thanks for your visit, and your questions! We’d love it if you kept coming around. And the best of gardening wishes to you! FORGIVE ME BUT I’M A LITTLE CONFUSED.IN YOUR STORY YOU SAID YOU HAD RIPPED OUT THE EVERBEARING PLANTS AND LET JUNE BEARING PLANTS TAKE OVER.BUT YOU SAID JUST ABOVE THE OPPOSITE THAT YOU RIPPED OUT JUNE BEARING PLANTS. AFTER A YEAR AND LET EVERBEARING TAKE OVER. I apologize Steve. I always did get those varieties flip-flopped sometimes! I have edited the post for correction and clarification. But for your knowledge, it was the June Bearing we ripped out, and let the Ever Bearing take over. Thank you Steve; I’m glad you enjoyed it. Yes, the hinges will make it much easier to manage alone. I think you just may need something for the cover to land on when open, to keep it propped up. Any gap to allow space for the cover to hinge down to the ground will allow critters to sneak into the bed. Best wishes and happy berry growing! They are beautiful! I am your newest follower. 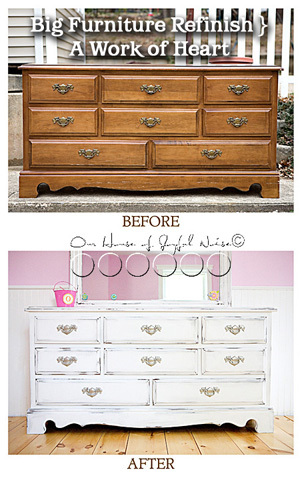 Loving you blog! Thank you so much, Megan! And thanks for following! Just peeked in at your blog too – beautiful family you have there!